Union, CT– This week, children from all over the country will attend a typical summer camp in Union, Connecticut. There will be rock climbing, archery, swimming and fishing. The kids will learn arts & crafts. The food will be just as you’d expect at an overnight camp. But the attendees, and the counselors will give you pause. 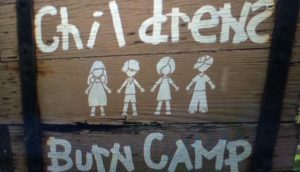 When I started to hear the stories from this special camp at the annual Arthur C. Luf Children’s Burn Camp fundraiser, nothing was going to keep me from checking it out. I wanted to learn about the kids, and talk to the firefighters and police who volunteer their time to make this happen. The camp is funded entirely from donations. Click Here to see video or to make a donation.